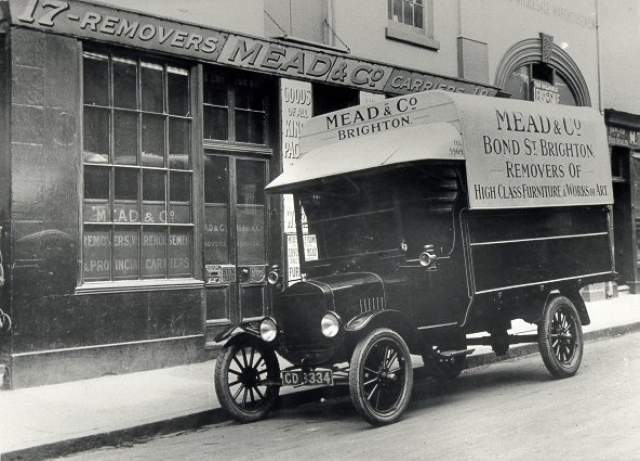 My grandfather ran ‘Mead & Co. Premier Brighton Removers’ at 17/18 Bond Street from early in the 20th century until his death in mid 1950s (family history not the Meads’ strong point!). The auction sale rooms were at 17 Bond Street. and Grandad’s office was at number 18. The family lived above it; my dad was one of 13 children. According to my older brother, there was a roof garden above that. After Grandad’s death it still traded as Mead & Co but later became Meads of Brighton (but with no Meads!) and then Michael Norman Antiques. It is now pure North Laine, being a fancy clothes shop and a cocktail bar. As Grandad was a lay reader at the Countess of Huntingdon’s Chapel nearby in North Street he must be spinning in his grave! I well remember as a small boy visiting the office on Saturday morning and offering my Grandad my Stanford Road school cap for a 3d bit or 6d to be popped in. My mother, no great fan of her father-in-law, was always scathing of his meanness. He did have eleven removal lorries, a garage and store on Dyke Road Drive, and at one time had a large house in Reynolds Avenue, now Valley Drive, Withdean. Next to 18 Bond Street was Mrs Gibbs, always pronounced JIBBS, who had a bird shop, and where we bought seed and sand for Joey our canary. Across the road was the pub The Wheatsheaf, this had a side passage that allowed you, when the pub was open, to cut through from Bond Street to New Road. The removal lorry shown in the photo is a c1924 Ford Model T Commercial. This was similar to the famous Model T car but with longer stronger chassis and heavier rear wheels. Note the lack of front brakes, oil side lamps, but electric headlamps. Probably bodywork by one of the local coach builders, I wonder which one? The Brighton registration number is about 1924. The original Brighton ‘CD’ series started in December 1903 ready for January 1904 and was completed in 1927. Thanks Paul, I have that image from a similar source. That is Grandad in the brown coat with clipboard and somewhere down the long line of drivers and their mates is my dad in his white removal man’s apron. I believe my grandfather worked at Mead showroom in Bond Street.